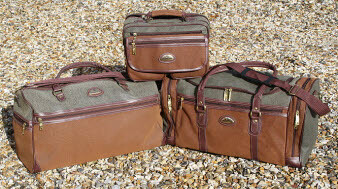 We just LOVE these holdalls and flight bags here in the office. Our practical green and tan faux leather canvas bag with gold coloured zips are smart, stylish and well made. Excellent luggage for flights, sports or weekends away. For those of you who have not seen these holdalls & flight bags up close please do not be fooled by the price. They are excellent value, very sturdy and will last for years. They are one of our most popular items! (Sorry to our international customers but due to the weight this is a UK and BFPO delivery only unless by prior arrangement). Visit our Travel Accessories department for passport holders, coin bags and more. This faux leather canvas holdall has a light green and tan colour with gold fittings. Extremely smart and has so many uses! Our smallest holdall or flight bag in this range. This faux leather canvas medium sized holdall has a light green and tan colour with gold fittings. Extremely smart and useful for so many things! Other matching bags available. This faux leather canvas holdall has a light green and tan colour with gold fittings. A very smart bag for business or pleasure. Our largest holdall in this range. A strong yet lightweight canvas holdall in green army camouflage pattern.